Jay Cutler is a sack-magnet. Cutler led the league in sacks last year with 52 and is currently the 2nd most sacked quarterback in the NFL with Sam Bradford taking that crown after a 7-sack performance Sunday. Most of the blame usually falls either on his offensive line or on himself for holding the ball too long. Both of these contribute to his sack-a-licious resume, but the biggest contributing factor may be the system in which he plays. 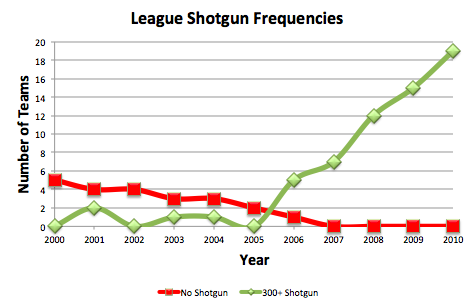 First, let’s look at the evolution of the shotgun offense. In 2000, just under 20% of all pass plays were taken from shotgun. 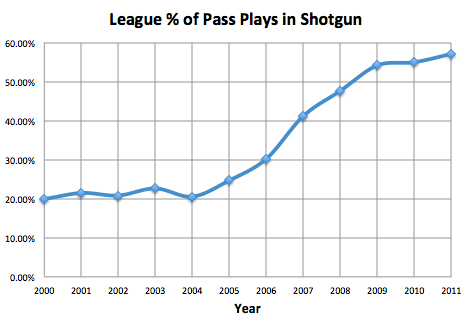 As of 2010, almost 55% of all passing plays were taken from shotgun (57% so far this year!). In 2000, 5 teams went the entire year without a pass from shotgun and no team had more than 300 pass plays from the gun. Last year, over half the league (19 teams) had more than 300 pass plays from shotgun. Already this year, every team has at least 30 shotgun pass plays. Which is what brings us to Jay Cutler. Last year, the Chicago Bears had the lowest percentage of shotgun passing plays at 15.1%. They were the only team to have less than 150 shotgun plays, and 1 of only 2 teams to have less than 200 shotgun plays. Now for Cutler’s sack numbers: 84% of Cutler’s sacks came under center. This should be qualified, though. The sack rate for Cutler both under center and in shotgun is nearly identical. The general thought, however, is that quarterbacks under center are sacked more often. This may not be true. In 2010, a QB was sacked from shotgun 6.3% of the time, while a QB under center was sacked 5.7% of the time. That being said, there is a correlation of -0.16 between shotgun rate and sack rate. If we look at a scatter plot between the rates, the correlation is due mostly to some outlier cases. While a low shotgun rate does not immediately explain Cutler’s high sack rate, it is definitely noteworthy. There has clearly been a shift toward the shotgun offense, but the Bears seem to be behind the curve. The high sack rate could be due to different defensive strategies when rushing against a QB in shotgun versus under center. On Sunday against the Panthers, Cutler had 20 passing plays, 0 out of shotgun. Once again this year, the Bears have the lowest shotgun percentage, throwing from the gun on only 20% of plays. Is there any explanation why he has been sacked so much in Chicago despite having the lowest sack rate in Denver? Let me guess, the top 6 or so points there (top left corner) are all Mike Martz. 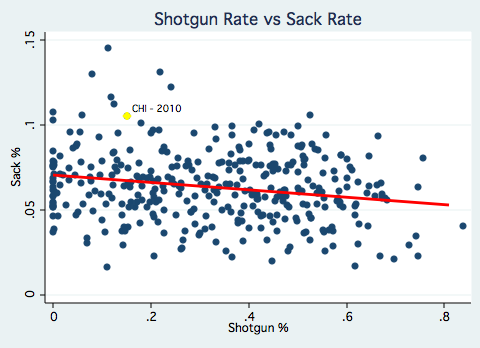 I'd also speculate that removing martz's seasons from that graph, will show that sacks do not depend on shotgun %. Actually, the Martz offenses aren't too bad. The 49ers from 2008 is up there. Martz' Rams sack rates are pretty average. A lot of the upper left is the start of the Texans franchise when Carr was getting sacked every other play and a few from the Falcon's in the early 2000s (the Mike Vick era). As for his numbers in Denver, there are a lot of potential explanations. Cutler's shotgun rates are much higher in those seasons as well, though. 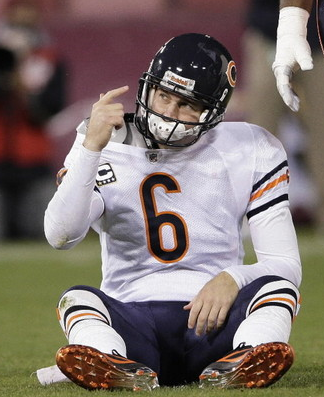 Cutler seems to be extending the wrong finger to his o line in that picture. This seems like a pretty weak argument that Cutler's tendency to get sacked has anything to do with the offensive formations. Maybe we should focus on the elephant in the room: Cutler is just not as good as he used to be. By just about any statistical measure, Cutler has not performed as well in 35 games with Chicago as he did in 37 games with Denver. This trend is most glaring in his sack rate, which has more than doubled since being traded. Recall that a QB's sack rate can largely be attributed to the individual QB, rather than his teammates, more so than any of the component passing stats that make up the official passer rating. See the p-f-r studies that compare stats when QBs change teams and when teams change QBs. The drastic increase in Cutler's sack rate should be viewed as an ominous sign that his career may be in decline, even at age 28. The conventional wisdom may be that Cutler hasn't gotten the necessary pass protection to perform well with the Bears. A more data-informed view is that his ability to avoid sacks and complete passes downfield has truly regressed and what was once a promising career is fizzling out prematurely. Roethlisberger's sacks are way up this year. Sanchez too. I guess that's because they both have regressed in their ability to avoid sacks. I'm sure it has nothing to do with their respective offensive lines, right? The point is, 1 single analysis of overall league-wide sack rate consistency between team changes does not mean sack rate belongs 100% to the QB in 100% of cases. I can provide you with overwhelming data that QBs don't 'tend to' dramatically increase their sack rates between age 26 and 28. Get a clue. Weak comment, anonymous. Next time, try to make your point without being a typical Internet troll. That's just my data-informed view. I don't know how to quantify it, but the Offensive Linemen, don't seem to be average., they are bad. Omiyale doesn't handle outside rushers well,(Plays Tackle) Chris Williams seems large but immobile(Plays guard) They get hit with injuries, (lance Louis Gabe Carimi) have to shuffle the line which makes every position weaker. Is there a way to determine an OL men's ability? Sack rate seems to show what has been apparent in Chicago for 3-5 years. The line has not been a positive aspect of the team for a while. For example, last sunday the Bears had passed 3 times with 6 mins to go in the first half. There was 1 completion, 1 sack, and 1 throw away. The pressure is embarrassing. Actually, Sanchez's sack rate is 7% this year compared to a career rate of 5.9%. Probably not a huge deal after just 4 games. Roethlisberger's rate of 9.2% is nearly identical to his fairly consistent career rate of 8.9%. Now compare Cutler's sack rate in Denver (4%) vs. Chicago (8.4%). Huge difference. It would seem hard to argue that it's due to the line once we know that line sack rates are essentially random after adjusting for the QB. Of course, we can't prove that Cutler is 100% responsible. But absent any strong evidence to the contrary, I think it's reasonable to conclude that he's mostly responsible. Yes, Alamar's blind side project is great and has enormous potential, as does J.J. Cooper's similar Under Pressure project on FO. I don't know that either has matured to the point where we can make any conclusions relevant to this issue. Let's hope they will in the future. Certainly not all QBs regress from age 26 to 28. But when the QB measurable most closely associated with individual skill decreases so dramatically, that doesn't seem like a good sign. I'd love to see data refuting the p-f-r study. Until then, the best publicly available evidence is that sack rates follow the individual QB much closer than the offensive line, and sack rates follow the individual QB much closer than any other basic passing stat. It's interesting how we give so much credit/blame to the QB for comp %, int %, yards/attempt, etc. and so little to his teammates. But when it comes to sack rates, we give the lion's share of the credit/blame to the line. If you believe the data, it should be the other way around. If offensive lines have a measurable impact on sack rates, why don't we see it in the data? Yes, it's counter-intuitive. And we used to think pitchers had control over BABIP too. The dude has a 7 step drop. I'm sure that has something to do with it.